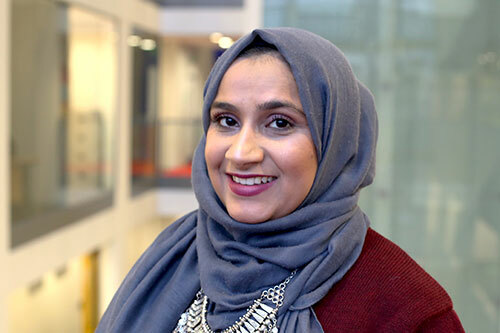 Aamena is a Mental Health Nursing graduate who enjoyed placements at the outstanding East London NHS Foundation Trust. I started my degree after taking a gap year to go travelling. I visited India, Dubai, Malaysia and Singapore. I thoroughly enjoyed my experience and would recommend the journey to anyone. What were the most important things you considered when applying to the University? I am what is known as a ‘home girl’. As much as my parents wanted me to move away and learn some independence, there was no way they could get rid of me as I simply wanted to stay at home. Therefore, location and transport means were vital in deciding which university I wanted. Also, the format of the course i.e. when we will be going out to placement and what kind of modules we will be studying was very important. It was great that I got the opportunity to hear first-hand on the experiences previous students had of the course and their opinions on the Open Day, this helped validate my choice. Once you'd received offers from different universities how did you make your decision to choose City? From the experience of visiting City and sessions I attended on the Open Day with the information I had accumulated about City, I simply knew that it was the place for me. I weighed it up against other universities with the same course but the location, format and experiences of previous students made the decision for me. My favourite thing about studying at City was that on my nursing course, we had a big affiliation with ELFT (East London NHS Foundation Trust). From the inspections conducted in the past, they received an ‘outstanding’ award. I think this is great considering that I can study and gain experience from a NHS Trust that has such great recognition. What kind of thingsware you involved in outside your course? I was an active member of ISOC (Islamic Society). I have organised and participated in several charity events. I have been a student representative for my course since first year. This meant that I was the bridge between staff and students. If students had any queries and didn’t know how to act on it, then they could turn to me for guidance and I helped guide them in the right direction or linked them with the appropriate member of staff. I also attended a general meeting every term with all the student reps from all the different schools within the University and lots of members of staff from different departments. We came together to speak about the progress of the University itself and what staff or students or even collectively what anyone can do differently to improve the courses or the University. I was also a Student Ambassador which meant I can select certain assignments such as student selection days or events the University are hosting to help on. This was a paid job so it definitely helps the pocket, but more than anything the flexibility of the job was what makes it easy to work and study. As I already have lots of experience of working with ELFT during my placements and it is close to home, I look forward to applying and hopefully working as a staff nurse within the trust. I hope to start off in an acute setting, as it is the most challenging and as a newly qualified nurse it only makes sense to put my energy in an area which can test me to the limit. Once I have gained lots of experience in managing such situations, I look forward to moving around the trust to different services such as forensics, CAMHS (Child and Adolescent Mental Health Services) and community settings. I would highly recommend applicants visit potential universities before making the decision to apply. What you see on paper isn’t everything. It’s important to see the university and really picture yourself being there and getting an idea of the location and surroundings.